one study concluded that arabinose can change the conformation of araC and prevent it from successfully binding to and repressing pBad. When grown with 0.2% arabinose, promoter is weak-medium. [jb, 5/24/04] Part may not be compatible with MC4100 as cell line is araD 139. >Internal Priming Screening Characterization of BBa_I0500: Has 1 possible internal priming site between this BioBrick part and the VF2 primer. For the BioBrick part BBa_I0500, the location of the internal priming site is on the 1151-1158 base number of the BioBrick and on the 5-12 base number of the VF2 primer. Team Slovenia 2010 further characterized pBAD promoter. Check results on Experience. IISc Bangalore 2016 showed catabolite repression of expression from the promoter by glucose. Check results on Experience. OUC-China 2016 characterized BBa_I0500 of different concentrations of L-arabinose on the transcriptional level. Check results on Experience. TU-Eindhoven 2017 optimized the expression on by testing 3 different temperatures, where 37 degrees Celcius proved most successful. Addition of L-arabinose has also been optimized to compensate for the breakdown of L-arabinose by the E.coli strain BL21(DE3) for mCherry and GFP expression. Check results on Experience. Team Glasgow 2017 improved this part by splitting its constituent parts into two separate BioBricks: BBa_K2442101 encoding minimal pBAD and BBa_K2442104 encoding AraC under regulation of LacI-regulated promoter. This allows for greater control over arabinose-inducible systems. See details on Experience. Import of arabinose into cells is mediated by the araE gene. Induction of the arabinose transporter encoded by araE can be uncoupled from the endogenous PBAD promoter by deleting the chromosomal araE gene and replacing it with a plasmid-borne copy of araE under control of a constitutive promoter (1). However, this does not seem to be enough to allow for homogenous expression from PBAD promoters in a population of cells (2). At low concentrations of arabinose, degradation of the sugar within cells also effects the homogeneity of expression from PBAD promoters (2). Arabinose degradation is mediated by the araBAD genes. Strains lacking functional araE, araFGH (another transporter), and araBAD can be made to be responsive to arabinose for PBAD promoter induction (2). This is achieved by introduction of a mutant lacY gene. LacY A177C allows for downhill transport of arabinose, as well as maltose, palatinose, sucrose, and cellobiose (3), but does not actively transport these sugars (4). Lactose import is not affected in this mutant. So, PBAD promoters in cells lacking endogeneous arabinose importers and containing LacY A177C are linearly responsible to arabinose at the individual cell level. By the way, AraC is the repressor of the PBAD promoter. It is encoded on the pBAD vector series and is still present in the above-described strains. PC and AraC are located on the complementary strand, reading right to left as written. At least one registry stock contains a deletion of the C at base 1194. This is after the transcriptional start but before the translation start, so it may not be significant. Parts with this mutation have been qualitatively observed to function normally. Expression by the pBAD promoter can be regulated tightly by induction and subsequent inhibition. The pBAD promoter holds great potential to control the expression of genes that require tight regulation, as it is capable of both an induction and repression. The HKUST-Rice iGEM team from 2015 found that the pBAD promoter exhibits an almost all-or-none behaviour upon induction with arabinose when located on a high copy vector, but allows for gradual induction when cloned into a low copy vector. Thus, it was evident that this promoter on a high copy vector would be inappropriate for tightly regulated gene expression. Based on these findings, a low copy vector was used to investigate the ability to inhibit gene expression subsequent to induction of pBAD. 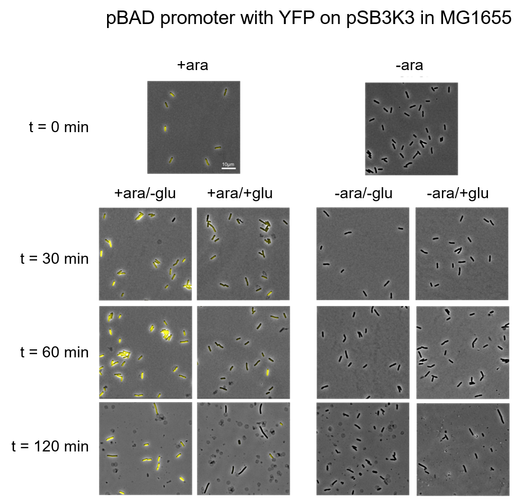 Gene expression was simulated by fluorescence microscopy using a pBAD-YFP reporter system, BBa_I6058. For this purpose, an Olympus IX83 with a photometrics prime camera was used with an exposure time for YFP at 200 ms. Transformed E. coli MG1655 cells were cultured in M9 minimal medium supplemented with 0.2% glycerol and 30 µg/mL chloramphenicol, to avoid catabolite repression from glucose residues present in LB medium. Two cultures were incubated, of which one was induced with 0.2 % arabinose from the beginning. At OD600=0.1, designated time 0, the cultures were split in two and 0.2 % glucose was added to one of each pair. Samples were obtained at time 0, before division of the cultures, and at 30 min, 60 min, and 120 min. The resulting images revealed, that the inducer arabinose was required to stimulate expression of YFP, and that the addition of the repressor glucose to a uninduced culture had no effect. Furthermore, it was evident that addition of arabinose induced expression of YFP, and that subsequent addition of glucose terminated the pBAD regulated gene expression, resulting in a reduced fluorescence level. 30 minutes after inhibition this reduction was already evident, and after 120 minutes the gene expression controlled by pBAD was even further decreased, as seen in Figure 1. Figure 1. YFP fluorescence levels in E. coli MG1655 transformed with the pBAD-YFP reporter system on pSB3K3. Left: Cultures with the inducer arabinose added. Right: Cultures not induced with arabinose. Both cultures were split up at OD600=0.1, designated time 0, and the inhibitor glucose was added to one half of each culture. Images were obtained at 0, 30, 60, and 120 minutes. This experiment made it clear, that gene expression controlled by the pBAD promoter is both inducible and repressible as required when cloned into the low copy vector pSB3K3.